I wear teal hair because it brings awareness. The dreaded “C” word invaded my life on Oct. 3, 2013 when I got the call no one wants to answer from Dr. S., 3 p.m. It was a Wednesday and three is not my lucky number. I was not shocked, but rather relieved instead. I knew something was terribly wrong with my body. I finally had answers to why I was feeling so bad. But, cancer? On Oct. 28, 2013 I began six weeks of chemotherapy and 25 rounds of radiation. We were treating Uterine cancer stage 3c. This treatment lasted until December. I rested for two weeks and then had a hysterectomy. The surgery went well. I would have two months off to recuperate, more chemo, and be done. Life would continue as usual. Right? When I went to have the 42 staples removed, I was in great spirits. We, my husband and I, had made it through the first rounds of chemo, radiation, and surgery. I was getting stronger. The fight was real and I was winning! Until….Dr. S. came back into the exam room with a folder. My husband and I were not ready for the news he was about to give. “You also have Ovarian cancer” Dr. S. said. I am not sure what all we heard that day. You kind of go into a dazed fog. These are a few of the things I remember: “It is extremely rare to have two major cancers. It is an aggressive cell. Your chemo regime will change. You have two weeks to rest. But it is stage 1,” said Dr. S. Well, there is something to be grateful for – stage 1. My husband and I left the hospital in total shock. This was a game changer. I remember the drive home. My tower-of-strength husband and I just looked at each other and really had no words. So, he took my to my favorite restaurant and I had a tostada. I knew the time was coming when food would be out of the question because of the treatments. We decided to do just what we had been doing. First, we had our faith, which is the foundation of our lives. It kept us grounded, centered and stable throughout the whole ordeal. Second, I had the best doctors taking the best care of me at the best hospital. Third, we relied on our wonderful support group of friends and family that loved and cared for us every step of the way. So, the second rounds of chemo began February 3 – there’s that number again! And ended in September 2014. One year has passed since my last chemotherapy. I still deal every day with the aftermath of treatment. I did not ask why or really shed a tear throughout the 18 months of treatment. But now, sometimes the tears won’t stop. I cry for the pain I endured; I cry for the ones that did not make it. The tears are cleansing and let me remember and at the same time, help me to forget. I am a survivor. I celebrate September. I celebrate one year, cancer free. I celebrate with teal streaks in my hair. Although my hair has been shocking at first sight, the color has been a banner of who I am and what I have endured. 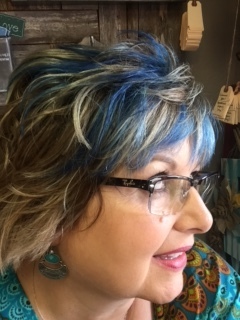 Not many 54-year-old women choose to color their hair this bright of a color, although it is popular and common with celebrities. Obviously, I do not fit into that category. 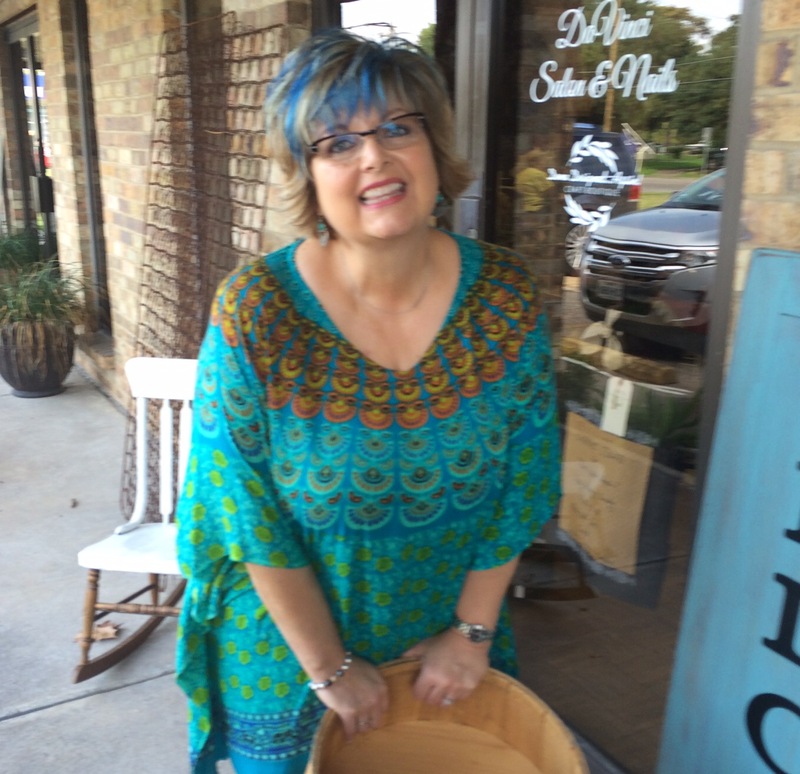 So, for September, I wear the color that represents ovarian cancer – teal. I wear it because I survived. I wear it because I have hair to color again. I wear it because everyone asks or makes a comment and I can testify that this terrible disease did not kill me. I beat it. I fought. I won!